Today, the enigmatic mountain of Isandlwana nestles peacefully amongst the majestic beauty of the Zululand hills. In January 1879, however, it was the site of one of the most dramatic and enthralling events in the history of the Zulu Kingdom during the Victorian era. Take time to relax at the luxurious Lodge and re-live the history of both the Anglo Zulu and Anglo Boer Wars, as well as enjoy the vibrant culture of the modern Zulu people. 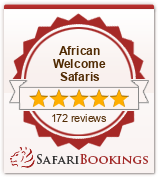 Or even visit one of the famous Zululand Game Reserves. and Durban via our national roads.The Lodge provides an excellent travel destination idea and, in addition to road access, there is a small airport at Dundee, 74km away. Isandlwana Lodge is within comfortable driving distance of several of South Africa’s most spectacular game reserves, enabling guests to combine enjoyment of Zululand’s rich wildlife heritage as well as the living history of the battlefields. The adjoining Umfolozi and Hluhluwe game reserves, (the most long-established on the continent) host ‘The Big Five’ (elephant, rhino, lion, leopard and buffalo), but are perhaps best known for the part they played in preventing the total extinction of Africa’s black rhino population. Both the black and white species of rhino are found here. Mkhuze game reserve (superb natural parkland beneath the Lebombo Mountains) is world famous for its abundance of bird life. More than 500 species of birds have been recorded in Mkuzi where visitors are encouraged to use the numerous hides on the river bank and lakeside to view the passing panoply of wildlife. Among numerous other reserves run by eZemvelo KZN Wildlife, Itala Game Reserve in the north offers visitors an opportunity to mingle with herds of giraffe, zebra and an amazing variety of antelope in a unique setting of valleys surrounded by almost mystical rock formations, reminders of the wild and untamed Africa of yester-year.